As you may already know I've been experimenting with gluten-free baking and my one foray into a vegan recipe, not so good. In my gluten-free adventures I wanted to make something chocolate, go figure. Since visiting a local health store I've been stocking up on a few different flours. I really like Red Mill's choices. I decided to choose a Oat flour to go along with my Almond meal flour. Coconut flour is on my list to purchase, but it was a bit more expensive. Also, if you haven't already noticed, I almost always use some sort of bittersweet chocolate. I like the richness of it and can control the sugar myself. I am not a milk or white chocolate fan. Occasionally I use semi-sweet. I stock up on this around holiday times, since everyone bakes and bittersweet chocolate chips go on sale, mostly use Ghiradelli, but Trader Joes has a BIG bittersweet chocolate bar option. Despite my miss-adventures this recipe was a hit, and as usual I experimented on my friends who loved it too. Butter an 8-inch round cake pan and line the bottom with parchment paper. In a large, heatproof bowl set over a pan of simmering water, don't let the bowl touch the water (SEE MY NOTE ABOVE FOR WHAT NOT TO DO). Melt the chocolate and butter until smooth, then remove from the heat and let cool slightly. You can also quickly melt this in the microwave. In a medium bowl, whisk together the egg yolks, half of the sugar, yogurt, vanilla, and salt, then whisk them into the melted chocolate. Stir in the almond flour, and the oat flour. In another bowl of a stand mixer, or hand mixer, whip the egg whites until they form soft peaks. Gradually whip in the other half of the sugar until the whites form firm peaks. Fold 1/3 of the whipped egg whites into the chocolate mixture to lighten it, then fold in the remaining chocolate mixture just until it’s completely combined. 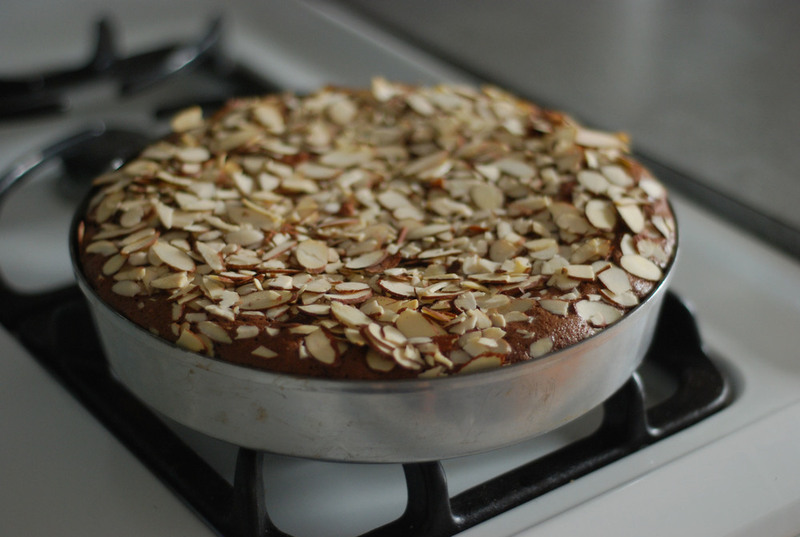 Pour the batter into the pan, level the top and then sprinkle a generous amount of Almond slices over the top, the more the merrier. This gives it a beautiful finished look and adds in extra crunch. Bake for 25 to 30 minutes; cake should be set and the center slightly soft. 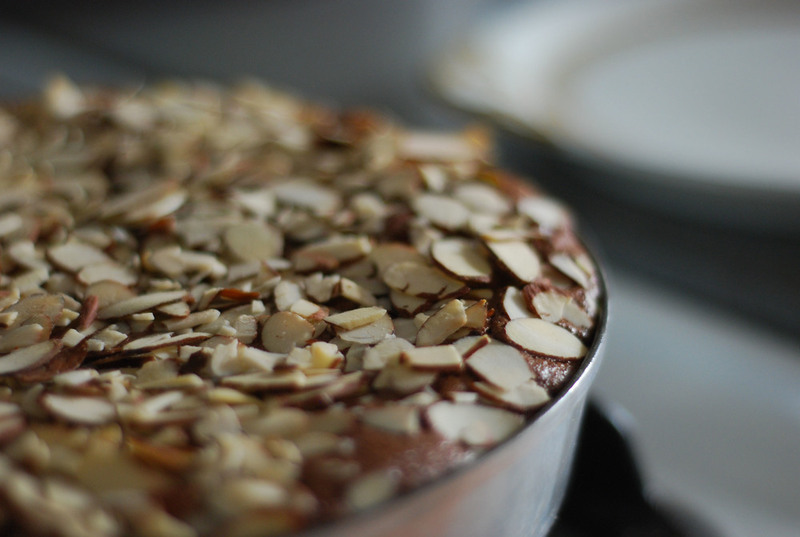 Let it cool for 10 minutes, then remove from the cake pan and serve. 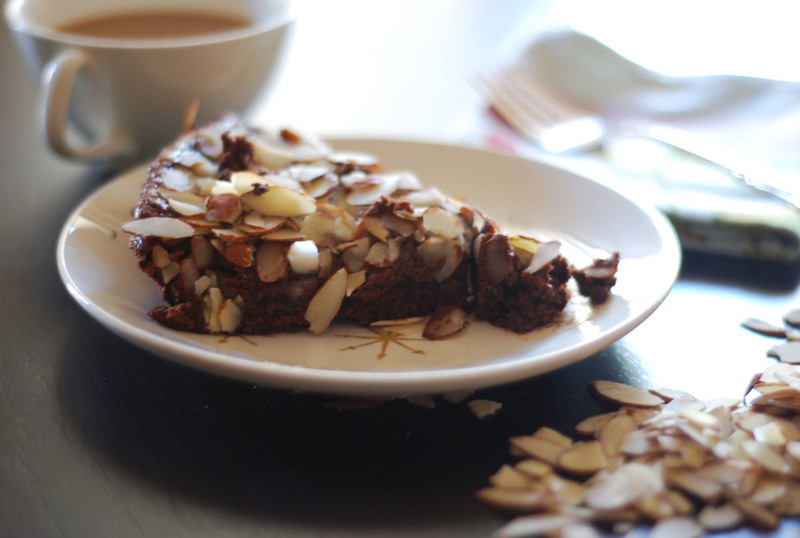 Posted in Bake, Baking, Food, Make, Sweets and tagged with gluten-free, almond, chocolate, almond flour, oat flour. September 19, 2013 by Tanya Ponce.